The project of developing Altami Studio Contour customised software was implemented for St.Petersburg Precision Machine-tool Plant (SPb ZPS LLC). This software is intended for control of modern optoelectronic system for displaying of processing contour (machine working zone) on the monitor instead of traditional eye-control of working operation. The previous obsolete system of contour rendering was based on laborious manual process of drawing a contour on a semi-transparent tracing paper and subsequent light projection of that contour into the work area of the machine. Considering the large scale, it was required to draw only a small part of the working contour on the tracing paper and, after processing it, again replace the tracing paper with a new sheet with another part of the contour. The new system renders the CAD-imported contour onto the wide-format monitor by applying this DFX/DWG shape to the real time video of grinding wheel and workpiece recorded from the digital camera. Altami Studio Contour software is designed to work in the hardware-software complex of the modernized 3951V-VT optical profile grinding machine. Development of Altami Studio Contour specialised software to visualize CAD-imported contour on the monitor overlaying it with hi-res video stream of the workpiece and edge of the cutting tool in real time. Development of app functionality that helps the machine operator to calibrate the calipers, define and display their linear and angular movement on the monitor in digital form. Support of contour drawing files imported from Autocad or similar CAD software. implementation of software into 3951V-VT optical profile grinding machine. The project task was to apply electronic system based on a video camera and computer with custom-developed Altami Studio Contour software to visualize and control the process of grinding workpiece according to CAD drawing contour. The specialized software is based on the general Altami Studio program package with the additional modules developed especially for this project. Display additional visual elements in the form of a displayed / hidden crosshairs of the coordinate system, inclined lines passing through the origin at an arbitrarily defined angle, a circle of an arbitrarily specified diameter centred at the origin. 1. Data processing module to send data from sensors to PC over PCI bus. An extension module was developed that reads the values of linear movement from sensors on the machine and uses them to calculate the linear movement of the contour image on the control monitor. 2. File format converter module from DWG/DFX to Altami Studio vector format. Ultra-fast file format converter was developed to convert a DWG/DFX drawing into an internal vector format of Altami Studio. When workpiece is under grinding, the software allows to use the drawing in DWG/DFX formats and “overlay” the workpiece contour to video image of grinding wheel cutting edge. This feature is useful for handling large workpieces that do not fit into a single field of view of a machine lens. This prevents from lose of processing accuracy. 3. The module of contour move on the monitor. A software module was developed to control the movement of contour image on the monitor according to machine sensors. 4. Control module for TCZR072 Lens. Software management module for digital lens (change of resolution, calculation of current zoom) was developed. The operator can specify a zoom within the application without using the controls on the lens itself (as it was in earlier versions of the machine). 5. Autocalibration module for lens optical axis displacement. The lens optical axis offset compensation module was developed. Without the compensation, the offset of the optical axis value might be as much as 20 to 40 μm, which could result to loss of precision during the grinding of the workpiece. The module allows to correctly move the contour on the monitor based on machine sensors. It calculates the calibration factor from the camera and the sensors (calculation of an object-image scale factor). 7. The contour forming module of the grinding wheel on the image. The module enables the machine to obtain a clear contour of the edge of the grinding wheel on the monitor and move it according to the movement of the machine sensors. Also, this module allows to calculate the angular movements of the grinding wheel image on monitor when moving the calipers of the machine. The module solves the problem of blurring the contour of grinding wheel image on the monitor due to the vertical oscillation (vibrational movements) of the grinding wheel. 8. Development of module for automatic calibration of binarization. To visually define the boundary of objects from background (workpiece, grinding wheel) in a bitmap image of the monitor, image conversion module was developed to transform halftone image into the black/white image. Calibration algorithm automatically calculates the position of the borders of the reference object, depending on the camera settings and the brightness of the lower backlight. This module allows to minimize the time of calibration of the binary image when setting up the optical system of the machine. This allows to machine operator to determine exactly how much the workpiece matches the contour imported from the DWG/DFX file during the grinding. During Altami Studio Contour software development, analytical work was done to study the specifics of the subject area (precision grinding machine-tool production). The factors have been investigated that influence the accuracy of the processing of workpiece on the grinding machine if use drawings (contours) from DFX/DWG files. 1. Displacement of the optical axis of the lens. Each shift of the lens zoom causes unpredictable moves of the optical axis on a small distance. This offset caused an error for grinding accuracy. To correct the problem, a software algorithm was developed to measure the axis move and reflect this error. 2. Calibration of the contour image movement. The calculation of contour movement on the screen gave an error if based just on the lens zoom passport values. A software calibration algorithm was developed using existing machine tools (precision linear movement sensors). 3. Calculation of the angular parameters for moving the calipers and grinding wheel contour on the monitor. According to project specs it was initially assumed that the calculation of the angular movement of the calipers machine and grinding wheel would be carried out using manual mechanical indicators. During testing, this method was considered difficult to understand by the machine operator because it was necessary to do a large number of measurements to perform the calibration (installing mechanical sensors, entering the correct statements into software app). New calibration method was implemented using image-processing tools and built-in calipers angular movement sensors. The suggested method showed good accuracy as the angle is determined by the error of a few angular minutes, which is sufficient for the task. 4. Automatic image binarization algorithm. When testing algorithms, it was found that it was difficult for the operator to determine the exact boundary of workpiece on the monitor because the boundary was represented by a smooth halftone transition. Binarization algorithm was developed to automatically convert grayscale halftone images to images in gradations of “black and white”. This conversion made it easier to verify the image of the processed workpiece against the theoretical contour. The developed method of automatic binarization minimizes the labor costs and time of this operation, allows the image to be displayed with high accuracy on the monitor. 1. PC based on Intel Core i3 3 GHz or better. Optional Ethernet or Wi-Fi network adapter. 2. 21-inch or similar monitor. 3. Altami Studio Contour software. 4. The optical-electronic system of the machine, including video camera with TCZR072 tele lens, linear movement sensors, and 941-PCI-G2 PCI-adapter for transmitting sensor data to the Altami Studio Contour program, two directed LED lighting sources (lower and upper). The figure shows a fragment of the screen with binarization turned on, combined with the workpiece and with CAD-imported contour (blue line) and a raster image of its working part superimposed on the video image of the grinding wheel (green field with a red border). In the center of the screen there are crossed red vertical and horizontal lines. Altami Studio Contour software with optoelectronic system by Altami Ltd developed jointly with SPb ZPS LLC allowed completely replace the obsolete optical system of the optical profile grinding machine and create a new 3951V-VT machine. Workpieces are now processed according to digital contours imported directly from CAD system. This allow to retire the process of manual drawing for multiple contour fragments in different magnifications on tracing paper or, at least, printing these fragments on plotter. This reduces the cost of preparation of production, the requirements for qualification and the number of staff. The application of visual elements as CAD-imported contour and dummy workpiece, combined with video image of the processed workpiece and the video image of the wheel allow grinding with high accuracy, reducing eye fatigue of the machine operator. Modern hi-res video camera allowed to reduce the power of the top and bottom lights by several times and to apply LED lighting designed by SPb ZPS LLC. Simplification of configuration and calibration when setting up the machine and when repairing it. 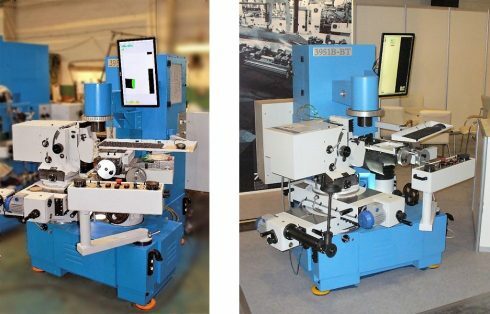 As a result, processing performance of the 3951V-VT optical profile grinding machine was greatly increased compared to a similar machine model that uses obsolete paper drawing to display the contour. The speed of preparing the machine to operation was increased many times by excluding the manual drawing on the paper phase and by automating the calibration of the machine calipers. For additional information on the development of computer vision systems in the industry, please contact Altami.